Not New Business: Billy is an infantile hominid. They opened the workshop with this video from the Department of Homeland Security. Which is odd, because some local naysayers were very sure that this matter was just some sort of teacher orchestrated boondoggle. Geniuses you are not. Further information about this catastrophic meltdown is available on the County Council Watch Watch page. Hats off to the dedicated public servant(s?) there for pointing us in the right direction. 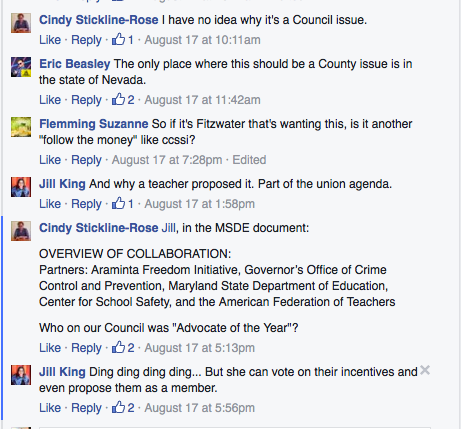 One of these “thinkers” by the name of Cindy Rose is running for the BOE. Is it possible that the crew here is so wedged into Blaine Young‘s rump dumplings that they forgot to A.) have empathy like human beings? and B.) that they too should be worried about kids (who are hopefully at school) vulnerable to some deviant lunatic predator on social media? Because that’s all it takes nowadays. Anyhoo, it is all well explained by Frederick Chief of Police Hargis. He had the experience of attending a youth/law enforcement forum where he actually met a couple of young victims of human trafficking, which made him more interested in the issue. One young lady came from poverty, described herself as a “bad kid” and had tried to improve her circumstances. She was exploited by a man she thought would rescue her from a miserable outlook. Another young lady had come from a family of means, but was trying to escape her parents’ bad relationship, ran from home and ended up abducted, raped, and enslaved in a motel room. One of his takeaways from these discussions was that it is important that they build rapports with victims and ask the right questions. That is what this task force is seeking to do. Build community protocols so that victims have a certain path out of victimhood, and establish the procedures to keep people from slipping through the cracks. It is truly a shame that the dialogue above is not the slightest bit concerned with the things that the speakers this evening talked about. It really makes you wonder about the community we live in. We have nothing but respect for the input of this panel this evening. Everyone doing their part to make people safer in Frederick County. And on that note, many thanks to Councilwoman Jessica Fitzwater for shining light on this issue. Previous postHear Ye! Hear Ye! Blaine’s verdict is in! Next postWe’ve reached the end of our rope with the one named Shreve!